David Godbold is one of Scorers1st clients with much upside. The Oklahoma City native had a great career with the Oklahoma Sooners in the BIG 12 where he was a starter in the squad of Jeff Capel and teamed up with NBA draftpicks Blake and Taylor Griffin. Used as an defensive specialist by coach Capel he always was tasked with stopping the opponents best player. 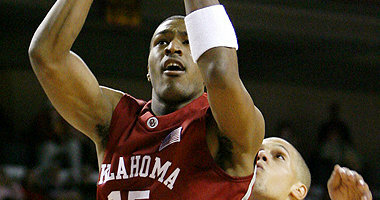 Despite his defensive assignments he still had impressive offensive games as well during his collegecareer. His first year playing as a professional overseas he ended up leading his team Stal SW from Poland to the play offs averaging 11.1 points, 4.9 rebounds and 2,1 steals. Combining all his skill he guided his team in the right direction in their first year in the topleague. David is a 6’5″ shooting guard that can beat defenders of the dribble and has a good 3point shot. He is also runs the floor extremely well and is a great leaper. David is a great player and person as well available for coming season. For additional information go to www.scorersfirst.com . To view the video we added from the Oklahoma Sooners Archive click here ttp://ow.ly/1LFYI . More videos from his season in Poland will be available soon.